Deep Purple History: Built in 1937, and the biggest cinema in England at the time, the Gaumont State in Kilburn, London, was the venue where Deep Purple were recorded for their third and final BBC In Concert. The show took place on May 22nd 1974, and was one of three different venues the band played in London that month (the others being the Lewisham and Hammersmith Odeons). It was broadcast as a special 90 minute show a few weeks later, and heavily bootlegged before finally appearing in 1982 on vinyl (albeit with Space Truckin' left off) as "Live In London" - the only full UK show by the band to be officially released. Perhaps because they were doing other London shows, there was no encore in Kilburn. 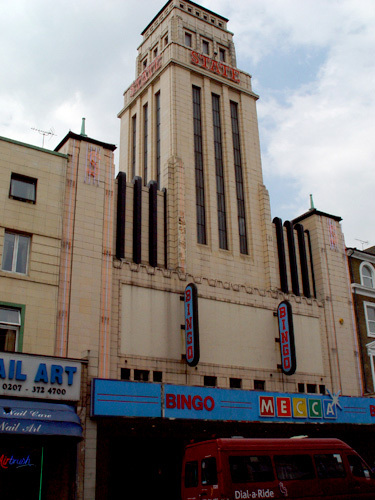 The venue had already been reduced in size to around 2,500 seats when Purple played there (with a bingo hall built at the back of the stalls in the sixties). A year later live music at the hall ceased and it was all then given over to Mecca bingo. In recent years a lot of the original interior has been restored. Viewing: The exterior and the foyer can be viewed from the street at any time - to go into the hall (open from lunch-time on) you need to become a member and buy a bingo card! Getting there: The cinema is on the main A5 Kilburn High Road, at the junction with the A4003 with Willesden Lane, and the tower can be seen from a long way off. The nearest tube is Kilburn - turn right out of the station. Parking close is very difficult as most of the area is residents only but it is possible to find spaces further away and stroll back.